"You might as well say, 'No black folks allowed,'" said Michelle Horovitz, who called Fox 9 when she spotted the sign outside the door. "It's ridiculous." She also contended, accurately, that the phrase "excessively baggy" is too subjective of a qualification to be enforced properly. "If you do not want African Americans to frequent your establishment, then maybe you should just say that, and not break it down to the dress code," said Imani Vincent, another local. "If they don't want us here, then we don't have to be there — and that's their loss." 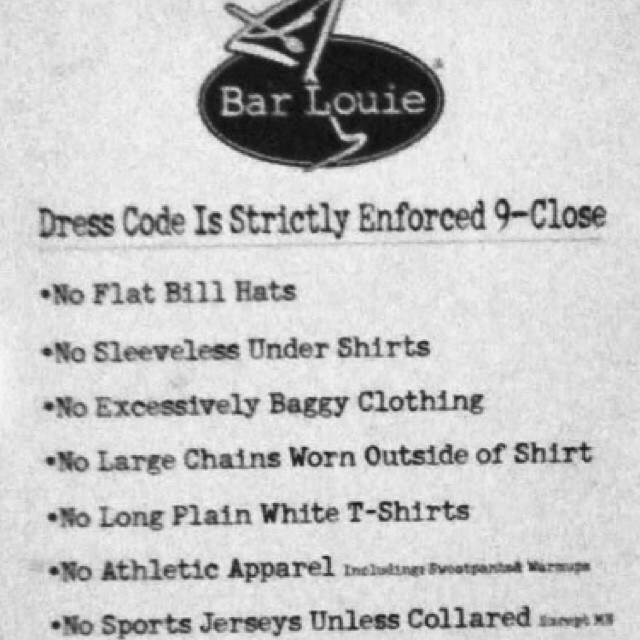 In addition to its Jim Crow problem, there are signs that Bar Louie just isn't a very good bar. It has two-and-a-half stars on Yelp, with one patron complaining that everything was sticky ("Sticky bar stools, sticky counters, sticky menus") and that her drink arrived "with a giant piece of shredded lettuce stuck to the side of the glass." Sadly, Bar Louie isn't the only bar in Minneapolis with a troublesome dress code: The Aqua Nightclub and Imperial Lounge both impose similar but slightly different requirements, although they're upscale nightclubs, not sports bars. ""Minnesota might be the nicest, healthiest, cleanest state in America, but we have huge issues as far as segregation, racism, systematic oppression -- and people want to look the other way," Horovitz told Fox 9. "This is not okay, and we're not going to patronize you if you don't change your policy."